Pleats are from the devil - Stop staring and start sewing! I hate pleats the way Indiana Jones hates snakes (I hate those too). I hope I'm never thrown into a pit of pleats (especially if there was an iron and ironing board in there). I'm making dresses for all 3 of my girls to wear to the youth banquet at church this Saturday (yes, I know it's 3 days away but thanks for mentioning it). Wouldn't you know 2 of the girls picked dresses with pleats, many pleats. I'm almost done with Olivia's and I have to admit begrudgingly, the pleats make it look nice (but they are soooo tedious). 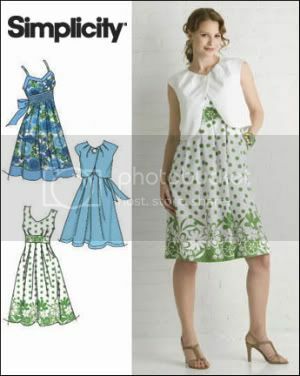 I'm using Simplicity 3867 with the fabric underneath (from Mary Engelbreit's Isn't Christmas Jolly? collection). It was surprisingly fast to make but I don't like the fact that I couldn't try the bodice on by itself because you have to adjust the bodice gathers while fitting it to the skirt. So I just used really big stitches so I could remove it easily to make adjustments. I only had to shorten the shoulder straps so there wasn't a lot of seam ripping to do fortunately. 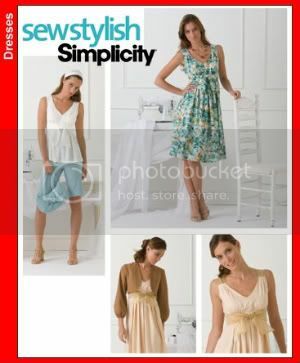 Peety picked Simplicity 2886 which is very similar (but different!). We haven't settled on a fabric yet. I think the modeled picture makes it look very boring (it seems like that happens a lot) but I think we can make it look snazzy with a little imagination. Or maybe no imagination...maybe it just needs a solid fabric? I recently decided I needed a new purse since my current bag is getting old (but I still love it!). 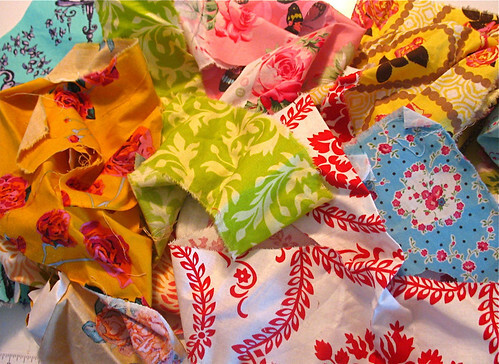 So I picked out some favorite fabrics to start with. 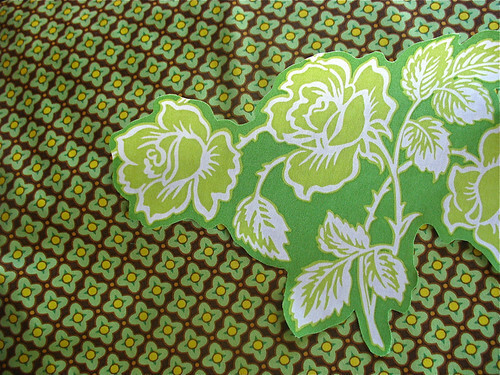 I really love this brown Tiled Primrose from Heather's Bijoux collection. I got a lot of sneak peeks while Heather was creating this line and this one always caught my eye. I think it's my favorite. 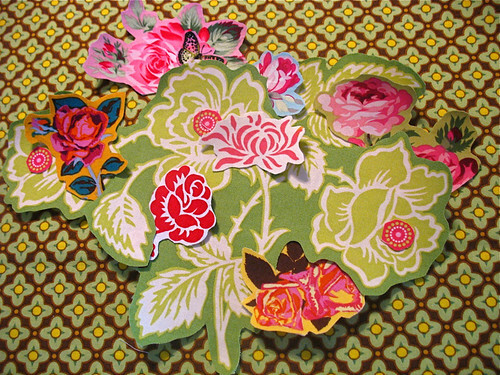 I thought it would be fun to soften it up with some of the Wallpaper Roses. Then I thought hey! I've got all these scraps, why don't I add to it? I wasn't sure how I was going to stitch it all in place then I remembered my machine has a free-style quilting option (which I've never attempted). I tried it and I like it! It allows me to go backward, forward, sideways, whatever. It took awhile to get the hang of it but I think I have it sort of figured out. Kind of fun and funky, don't you think? I've decided to turn it into a pillow instead. I think it needs to be part of my home decor. And I'm thrilled because I just received another huge shipment from Free Spirit about 2 hours ago! 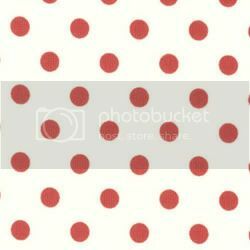 I'm sorry to say it's not the Robots fabric (that's coming in a few days though...with Darla! ), but it's lots more Ava Rose, Bell Bottom and Pop Garden. 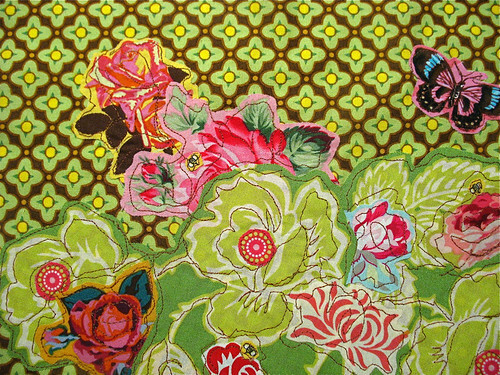 And the best part (for me anyway) is I'm finally carrying Kaffe Fassett's fabrics and they are stunning! Everything is still 15% off for the rest of the month too! And I'm joining many other blogs and taking part in Give-Away Day (such a great idea)! 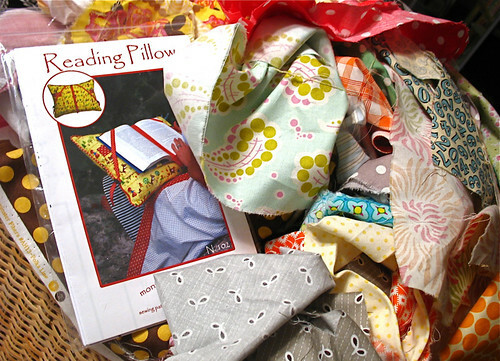 I have copious quantities of scraps around here so I thought I would just give away a big assortment (it will equal at least 2 yards) of different sizes of scraps and this darling Reading Pillow pattern from Sew Liberated! That could keep a person busy for quite awhile. Just leave a comment. I hope everyone is having a great December so far. Don't get too stressed and if you do get stressed just grab a nice cup of tea and put on some soft music...nice. That's my therapy anyway. Oh, and sew!